When I was in university, my friends and I would occasionally go to the nearest Shoppers Drug Mart and buy some of their face masks. We would then go back to the dorm and, usually with a beverage or two (or more) in hand, do the whole cucumber slices on the eyes thing while whatever moisturising, nourishing, anti-wrinkle (a big deal at nineteen, you know), exfoliating goo did its work. I’m usually in Shoppers, because I’m out of shampoo or I need new nail clippers, when I have this idea. So far, I’ve only ever gotten as far as scanning the face mask selection before I remember I only enjoy slathering goo on my face when in the company of friends. The same rule applies to nail polish. The wine is good too, but wine alone is not sufficient to make the goo and polish fun for me. All that to say, I was at Shoppers today perusing the selection of face masks. The expected varieties were there: aloe vera, argon oil, coconut and papaya, various citrus fruits and oils, cocoa and shea butter with a picture that looked like chocolate pudding (I was hungry). Then there was the volcanic ash and blue-green algae mask. At this point, I would have raised one eyebrow if I were capable of moving my eyebrows independently. That brow would not have been alone for long, however, because next I saw the caviar and pearl dust mask. I can only imagine the high-quality pearls that went into this 5-dollar product. Neither of these were my favorite, though. The synthetic snake venom anti-aging mask. 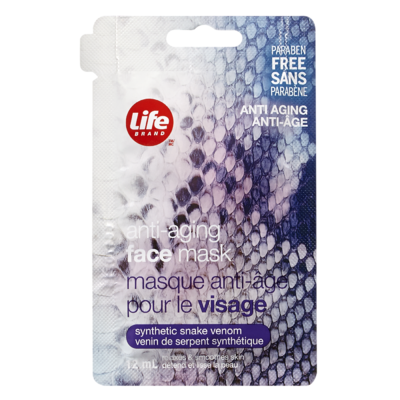 Obviously, seeing as the venom is (gasp) synthetic, this mask may not appeal to the all-natural, organic-only community. I imagine ongoing debates about the merits of synthetic vs genuine snake venom are forthcoming. Note, however, this mask is labeled paraben free. Parabens are exactly what I’d be worried about while smearing snake venom on my face. Yet again, I left the store without purchasing a face mask. Wow, I mean good that it's synthetic, I am surprised you didn't see any bee venom though, that seems to be 'hot' right now.